Daily Dragon (DD): First, welcome back to Dragon Con! We’re happy to have you. What is it about Dragon Con that brings you back? 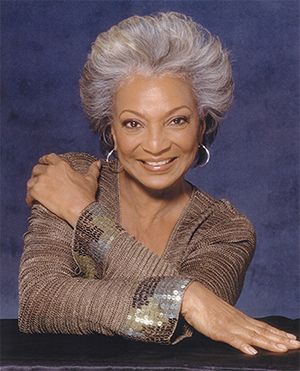 Nichelle Nichols (NN): Always my fans. They love me and I love them. DD: Between television and film, you portrayed Nyota Uhura for over a quarter of a century, making her one of the most iconic characters in science fiction and in popular culture in general. How did you first learn about the part? NN: I was in Europe on a singing career and got a call from my agent, who had received a personal call from Gene Rodenberry requesting me for an audition. I had already worked for Gene in “The Lieutenant,” and I was his first thought for the role. DD: Your most well-known scene from Star Trek was the kiss between Uhura and Kirk in the episode “Plato’s Stepchildren.” What were some of your other personal favorite onscreen moments for Uhura? NN: The kiss was certainly one of the most memorable, without question. But anytime I got to leave the bridge and go to the planet, that was always the most fun. DD: What were some favorite moments off camera? NN: [Anything with] George Takei and Walter Koenig because they have become such great friends. DD: Have you read any of the many Star Trek tie-in novels featuring your character? NN: Most all of them. DD: Have you seen the Star Trek reboot movies? What do you think of Zoe Saldana’s portrayal of Uhura and where the new films have taken the character? NN: Zoe has done such an amazing job with the character, and I have met with her several times over the years. She’s fantastic. I am producing an amazing feature film, and I want her to play the lead role as my daughter. I mentor the family and am the matriarch of the family. DD: After the original Star Trek series ended, you began working with NASA to help recruit women into the space program and advocate for space exploration. What do you think have been the greatest successes you’ve had a hand in through that work? NN: The amazing people I was able to meet who went on to do such great things inside NASA—Sally Ride, Mae Jemison, current director Charlie Bolden. Helping bring such talents forward to be recognized is one of my greatest achievements. DD: Even though most people know you as Uhura, many may not know that you toured as a singer with the legendary Duke Ellington and Lionel Hampton. Tell us a little about that. NN: It all started when I was 15 years old and auditioned to be a dancer and backup singer for Duke Ellington. It didn’t take long for Mr. Ellington to notice me and move me to a lead singer role. Having studied ballet, I had a great dance background, too. DD: We were all very concerned to hear about your health issues earlier this year. We hope you’ll be bringing us much more entertainment for many years! What do you have coming up next? NN: I plan to be around a lot longer. “Can’t keep a good woman down!” I am executive producing and acting in a project I love. Noah’s Room deals with racism, redemption, equality, forgiveness, and most of all, love. Due to recent events, it is vital that I get this made. In a few weeks, I’ll be on a NASA SOFIA [Stratospheric Observatory for Infrared Astronomy] flight, taking off into the stratosphere with an airborne observatory. I’ll be sharing as much as I can live through my account on StarPower, which is a social media and charitable fundraising website I co-founded.